A total lunar eclipse set to takeplace next Monday nightand Tuesday morning (Dec. 20-21) will be well-placed for observersacross NorthAmerica to catch a view. On the East Coast, it begins halfan hour after midnight onTuesday; on the West Coast, it begins around 9:30 p.m. PST Monday. Inallcases, thewhole eclipse will be observable before the moon sets in thewest just asthe sun is rising in the east. Maximum eclipse is at 3:17 a.m.EST/12:17 a.m.PST. During a totallunar eclipse, the Earth gets between the full moon and thesun, blockingthe sun's light from bouncing off the lunar surface. Although lunareclipsesoccur fairly frequently, usually at the rate of about two a year, theyoftenhold surprises. No one knows until the eclipseactually occurs how deep itwill be and what color the moon will show. This is determined byweatherconditions around the Earth?s rim at the time of the eclipse, as thesun'slight is colored and refracted inward by thousands of sunsets andsunrises. If the air is clear around the rimof the Earth, theeclipse may be quite light; if cloudy, quite dark. Again, depending onthosesunrises and sunsets, the moon may appear orange, red, dark brown orslategray. 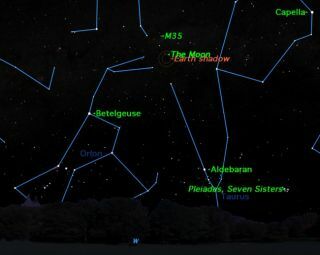 Thisstar chart shows where inthe sky the upcoming lunareclipse willappear. And check thisNASAlunareclipse chartto see how visible the eclipsewill be from different regions around the world. Astronomers often try to estimatethe magnitude, orbrightness, of the eclipsed moon. Because the moon is much larger inapparentdiameter than the stars and planets, it's necessary to "shrink" themoon to make comparisons more accurate. One way to do this is to viewthe moonthrough binoculars the wrong way around, looking in the objective end.Anotherway is to view it in a reflecting garden globe. It is fun to repeat theobservations made by early Greekastronomers of the curve of the Earth's shadow on the moon's face,which theyused to prove that the Earth was round. Greek astronomers also used thecurveof the Earth's shadow to calculate the relative sizes of the Earth andmoon. One thing worth observing is how differenttheshadow of the Earth falling on the moon looks compared to the regularphases ofthe moon observed every month during the year. There's a common folkbeliefthat the moon's phases are caused by the shadow of the Earth falling onthemoon, rather than by the sun illuminating the spherical globe of themoon fromdifferent angles. The moon's shadow during an eclipseis much less curvedthan the lunar terminator, and always concave. TheEarth's shadow isstrongly colored by light refracted through the Earth's atmosphere,while thenormal lunar terminator is colorless. One special object to look for inthis eclipse is the openstar cluster Messier 35 in the constellation Gemini. This will be justthreedegrees above the eclipsed moon, half a binocular field away. It's alsointeresting to see how many faint stars you can see when the moon isfullyeclipsed ? you will see far more than are visible against the brightfull moonbefore and after the eclipse. A lunar eclipse makes for many photoopportunities. Be sure to bracket your exposures(try different exposureslonger and shorter than what your meter says) because a bright moon ina darksky often fools cameras' exposure meters. If you normally keep a filteron yourlens for protection, take it off to photograph the eclipse; otherwise,you mayspoil your pictures with a ghost image of the moon. And use a telephotolens ormaximum zoom: The moon always looks larger to the eye than it does onfilm. Besure to take some wide-angle shots as the moon gets lower in the skytoward theend of the eclipse. This article was providedto SPACE.com by Starry NightEducation,the leader in space science curriculum solutions.